Need a great bridal shower gift certificate idea, but don't know where to start? Whether you've been asked by the hostess to bring one, or decided on your own to give one, you will have a variety from which to choose. There are ways to narrow down your choices. The personal tastes of the couple will often influence your selection. Their age and hobbies might also enter into your decision. It may help to answer some basic questions. If there's a bridal shower theme, then base your gift around it. For example, if it's a bedroom theme, then give a certificate to a bed and bath shop. Is the couple just starting out? They would benefit from a general department store that carries almost everything, or a home supply store. Is the couple older, or were they previously married? In this case they have all the basics. Look to their hobbies for an idea. What else do they like to do socially? Do they like dining out? You're sure to find several restaurants in their area that they would enjoy. It could be a favorite, or one they haven't tried yet. Do they have an interest in a particular sport? Give them a card to a golf, tennis, or bike shop. Ask each guest to contribute their own bridal shower gift certificate idea, ahead of time. This can be a service or gift item. Print each response as a coupon, and assemble into a booklet to be given to the bride. These can redeemed at any time in the future. Ideas submitted can include help with painting the house, cooking a meal, or yard work. 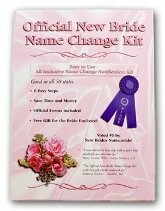 • Go from gift certificates page, to Bridal Shower Ideas For You homepage.